As the head cross country, track and field coach at Birmingham-Southern College, Kenneth has achieved tremendous success. 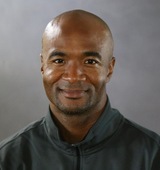 His accomplishments are many, including two-time conference coach and regional coach of the year, Second Vice President for the US Track & Field and Cross Country Coaches Association, 5 individual national and 38 individual conference titles, 26 All-Americans, and 3 regional athletes of the year. In 2017 alone, the BSC Panthers received 27 all-region selections, 22 all-conference nods, 11 individual SAA titles, six national qualifiers, four All-American honors, two national titles, and a conference championship. The foundation for his success lies in his determination, discipline and faith. Always an athlete, he competed on the men’s track and field team at The University of North Carolina. He received his Bachelor of Arts degree in Communication Studies in 1999. He is a member of Phi Beta Sigma Fraternity, Inc.